Let’s say you’re 15 years old and you want to annoy your parents. But how? Dad used to stagedive at Black Flag shows and Mom embarrasses you by wearing her old Dead Kennedys T-shirt to the grocery store. What’s a suburban smartass to do when punk’s become nostalgia for late boomers and so many current punk bands are just the Backstreet Boys with a handful of hair gel and an endearing little sneer? She could do a lot worse than buying Sleater-Kinney’s The Hot Rock. 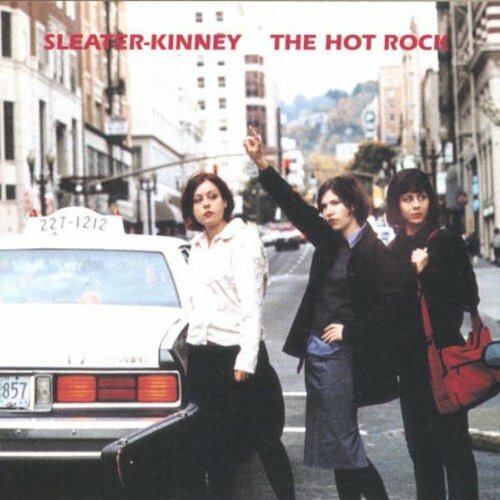 Sleater-Kinney has managed the impossible: they’ve brought the harshness back to punk rock. By avoiding the formula that’s straitjacketed punk bands for ten years now (Buzzcocks melodies, Ramones guitar, snotty Dead Boys lyrics), they bring garage punk back to its roots — a caterwauling racket sure to make everyone in firing range beg for mercy. Singer Corin Tucker sounds like a broken, droning air raid siren, each piercing note quivering with vibrato. With no bassist and two lead guitars playing halting little melodies, the band has a uniquely tinny, clanging timbre. No one else sounds anything like them, though on your first encounter you may think that’s because no one else would ever want to. But that’s just the first few listens. Give them a chance to grow on you and the noise sorts itself out, revealing songwriters of rare craft and urgency. (Remember how discordant, how raw and ugly, the first Clash album sounded on your first try? And how great it sounded a week later?) Over the course of four steadily improving albums, they’ve explored the pitfalls of growing up female and confused with a passion and delicacy belied by the ferocity of their din. The Hot Rock is a huge step forward by a band that was already doing major work. Carrie Brownstein’s voice is used to great effect, sweetening Tucker’s attack with harmony and counterpoint. The guitar interplay, always charged and eccentric, is now more densely layered, creating textural depth within the simple song structures. These small touches serve to make the record more palatable without softening its impact. The lyrics court cliche but work anyway: the blunt emotionality of Tucker’s delivery overwhelms their pathos. And in the title song, the plot of the routine ’70’s action movie that the song takes its name from provides an extended metaphor for the uncertainties of a new love affair. It’s a clever conceit, and it suggests further avenues the band might explore next time out. Even as they edge towards maturity and downplay their signature abrasiveness, Sleater-Kinney remains a difficult proposition. They’re worth the effort.